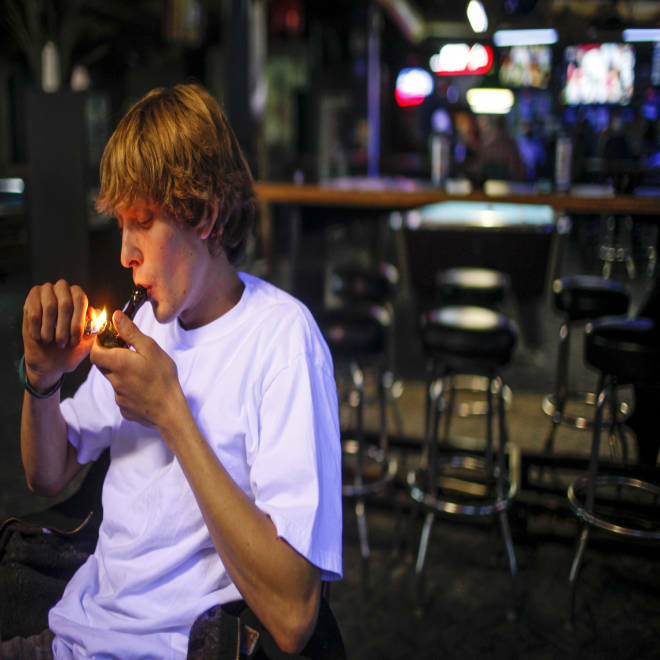 Russell Diercks smokes marijuana inside of Frankie Sports Bar and Grill in Olympia, Wash., Dec. 9, 2012. A majority of Americans want the federal government to keep out of state marijuana laws, even as overall sentiment on whether marijuana should be legalized is split, according to a new poll. Sixty-four percent of adults responded "no" when asked whether they think the federal government should take steps to enforce federal anti-marijuana laws in states where marijuana is legal, according to the USA Today/Gallup poll released Monday. "The significant majority of Americans would advise the federal government to focus on other issues," wrote Frank Newport of Gallup. In Washington and Colorado, where citizens last month voted to legalize marijuana possession, the issue of federal interference is especially salient as residents face a confusing mishmash of federal and state laws when it comes to whether and where they can get high. That’s because the federal government still bans pot growing and possession, regardless of what state laws say, leaving many residents confused about what is legal. Some observers say it may take the Supreme Court to clear up the situation. Americans who personally believe that marijuana should be legal overwhelmingly say the federal government should not get involved at the state level; even four in 10 of those opposed to legalized marijuana don't think federal officials should intervene. It’s unclear at this point whether the Justice Department will try to stop the decriminalization of pot in Washington and Colorado, where adults 21 and older will be allowed to purchase a small amount of pot from state-licensed stores. The drug will be heavily taxed and potentially bring hundreds of millions of dollars a year for school, health care and government needs. Although support for legalizing marijuana has risen substantially over the last four decades, the poll, which also asked participants where they stand on the issue of legalization, revealed that the public remains largely divided. Six in 10 Americans aged 18 to 29 support legalizing marijuana, while about as many of those 65 and older are opposed. The bulk of middle-aged Americans – those aged 30 to 64 – are split on the issue of legalization. The poll also noted that Democrats were most in favor of legalization, while Republicans were most likely to be opposed. Lawmakers in four New England states, including Maine, Vermont, New Hampshire and Rhode Island, have signaled that they plan to introduce proposals to legalize marijuana in the next year, according to the Marijuana Policy Project. Currently, 17 states and the District of Columbia already have laws allowing for the medical use of marijuana, according to the National Council of Legislatures.